The name “Failla” comes from the Italian island of Sicily, the melting pot of southern Europeans. 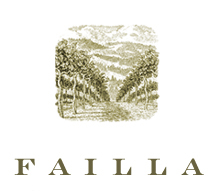 Founded by husband/wife team Anne-Marie Failla and Ehren Jordan in 1998 as “Failla Jordan”, they rebranded as “Failla” in the fall of 2002. Known to experiment with his favorite varietals, Jordan coaxes out their various incarnations from different climates, soil types and rootstock. Their portfolio currently includes Pinots from the Hirsch Vineyard on the Sonoma Coast as well as their original Keefer Ranch. Pinots from Occidental Ridge and Rancho Santa Rosa arrived in 2005. In 2006, they introduced Appian Way Pinot Noir from the Russian River Valley and Peay Vineyards and Estate Pinot from the Sonoma Coast.